CADD Centre Training Services Private Limited, a diversified global network of creative, engineering and management skill development institute has become the official Education Training Partner in India for Dassault Systèmes, a world leader in 3D design software, 3D Digital Mock Up and Product Lifecycle Management solutions. 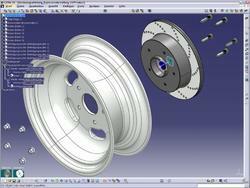 We are the growing company known for providing CATIA V5 Training to the clients. CATIA V5 Training is carried out by our professionals using advance technology. This service can be availed by our customers within committed time frame. Additionally, we are providing it at market leading price to our clients. Ensure the chances for getting the job opportunties by joining Authroized training on CATIA with valid certificate. Industry projects are free to have hands-on experiences along with training. CADD SCHOOL is one of the best CATIA Software training institute in Chennai, CATIA Course conducted by CADD SCHOOL is industry specific.